Harvest Lori Mitchell, by ESC and Company. Harvest figurines of darling girls and boys dressed for the fall season, a category for you folks that love autumn but not necessarily Halloween. We have pilgrims, native americans, turkey, owl, and more! 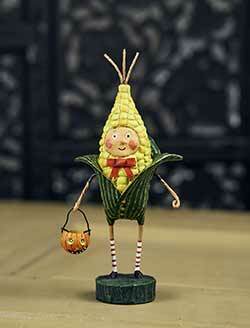 Lori Mitchell figurines area always best-sellers, but the Harvest & Halloween are always the most popular. 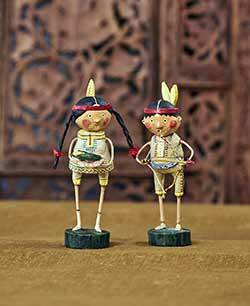 Indian Guide & Indian Princess, by Lori Mitchell for ESC and Company. Darling Native American Indian couple for Thanksgiving! Old Crow, by Lori Mitchell. 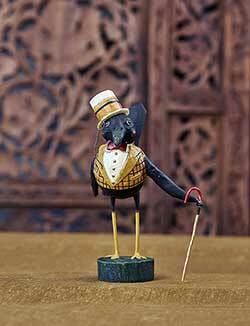 This dapper gentleman crow is all dressed up for fall, complete with top hat, plaid vest, and a cane! Tom and Goodie, by Lori Mitchell for ESC and Company. Sweet pilgrim girl and boy for Thanksgiving! 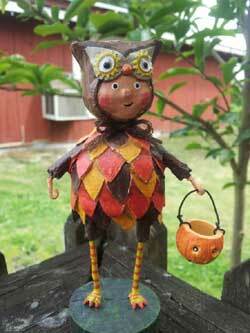 Tom and Goodie Gobbler, by Lori Mitchell for ESC and Company. 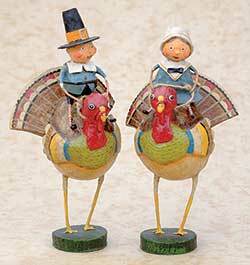 This pilgrim couple are perched atop brightly painted turkeys, ready for Thanksgiving! You receive the set of TWO. Turk or Treat, a Lori Mitchell design for ESC and Company. Adorable turkey boy!